Panathinaikos midfielder Wakaso tested keeper Fabrice Ondoa will a brilliant bending free-kick, and Newcastle's flying winger Atsu saw his angled strike drift past Cameroon's upright by inches. Aside from those two chances, the Black Stars - who last won the competition in 1982 - underwhelmed against a side who were clear second favourites going into the match. As for coach Hugo Broos' Indomitable Lions, they are into their first final since they lost to Egypt in 2008. "It is a real dream for us to get to the final," said the Belgian coach. "Ghana have more experience than us - look at what they have done in recent tournaments. But since the start of this tournament we have shown we keep going right to the end in every game. "I am very happy, especially for the team. They are an exemplary group on and off the field and they deserve to be in the final." Their build-up to the match was clouded by a dispute between the team and the national association over pay, but on Gabon's Franceville stadium pitch their focus rarely wavered from the task in hand. Cameroon defended brilliantly, nullifying the threat of Andre Ayew and brother Jordan - and, later on, substitute Asamoah Gyan. "I am more than unhappy. We wanted so much to be in the final," said Grant. "We did everything to be there and in the second half we completely dominated. Congratulations to Cameroon of course but we were the better side and we lost." The Black Stars will meet Burkina Faso in Saturday's third place play-off in Port Gentil. Match ends, Cameroon 2, Ghana 0. Second Half ends, Cameroon 2, Ghana 0. Goal! Cameroon 2, Ghana 0. Christian Bassogog (Cameroon) left footed shot from the centre of the box to the bottom left corner. Assisted by Vincent Aboubakar following a fast break. Frank Acheampong (Ghana) wins a free kick on the left wing. Attempt missed. 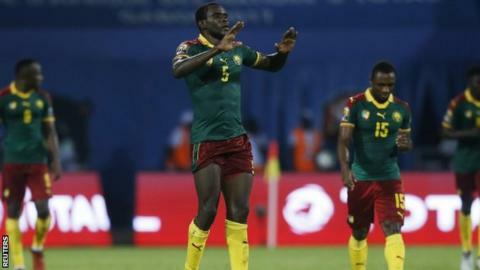 Vincent Aboubakar (Cameroon) right footed shot from the right side of the box is just a bit too high. Assisted by Christian Bassogog following a set piece situation. Foul by John Boye (Ghana). Jacques Zoua (Cameroon) wins a free kick on the right wing. Substitution, Ghana. Emmanuel Badu replaces Thomas Partey. Delay in match Fabrice Ondoa (Cameroon) because of an injury. Corner, Ghana. Conceded by Fabrice Ondoa. Corner, Ghana. Conceded by Sébastien Siani. Attempt blocked. Asamoah Gyan (Ghana) header from the left side of the six yard box is blocked. Assisted by Jordan Ayew with a cross. Corner, Ghana. Conceded by Collins Fai. Benjamin Moukandjo (Cameroon) is shown the yellow card. Jordan Ayew (Ghana) wins a free kick in the defensive half. Hand ball by Asamoah Gyan (Ghana). Offside, Ghana. Mubarak Wakaso tries a through ball, but Asamoah Gyan is caught offside. Substitution, Cameroon. Georges Mandjeck replaces Arnaud Djoum. Substitution, Ghana. Asamoah Gyan replaces Afriyie Acquah. Attempt missed. Jordan Ayew (Ghana) right footed shot from the centre of the box is close, but misses to the right. Assisted by Harrison Afful. Substitution, Cameroon. Vincent Aboubakar replaces Robert Ndip Tambe. Goal! Cameroon 1, Ghana 0. Michael Ngadeu-Ngadjui (Cameroon) right footed shot from the left side of the six yard box to the top right corner following a set piece situation. Robert Ndip Tambe (Cameroon) wins a free kick in the attacking half. Foul by André Ayew (Ghana). Christian Bassogog (Cameroon) wins a free kick in the attacking half. Corner, Ghana. Conceded by Adolphe Teikeu. Corner, Ghana. Conceded by Michael Ngadeu-Ngadjui. Attempt blocked. Daniel Amartey (Ghana) right footed shot from the centre of the box is blocked. Assisted by André Ayew. Corner, Ghana. Conceded by Benjamin Moukandjo. Afriyie Acquah (Ghana) wins a free kick in the defensive half. Foul by Arnaud Djoum (Cameroon).